Selecting the right paper shredding machine for the needs of your office can take time and sometimes be confusing, especially with the extensive choice of brands and different kinds of paper shredders available on the market. All paper shredders have inbuilt safety features that will render the device inoperable if the cabinet door is open or when lifted from its bin or cabinet. Some paper shredders use in addition a touch or pressure sensitive paper feed entry that when touched, halts operation of the shredder instantly. Most shredders using the sensitive paper feed feature adopt the method of capacitance to halt operation, that said, in humid conditions this feature can malfunction becoming an annoyance. Cross Cut Paper Shredders are generally the most popular of paper shredding machines, providing the level of document destruction that most offices expect now days, these are generally P4 security level paper shredders. 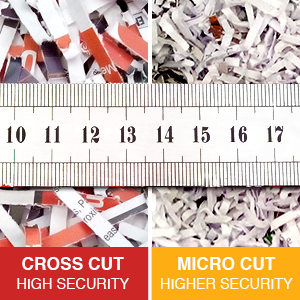 For government departments, defence forces and government contractors who manage security classified data such as Top Secret information, high security shredders are the only choice, commonly described as Micro Cut and Super Micro Cut paper shredders. These are generally P5, P6 & P7 security level paper shredders. Usually simple to determine by knowing what paper sizes you need to shred, the choice of a A4, A3 or Wider Paper Format feed entry shredders are available. Generally, the wider the paper feed entry, the greater the waste capacity due to wider cabinet structure. Shredders with wider paper feed entrances are generally a greater cost compared to same capacity A4 variants. If you shred 500 sheets per week and 20 sheets, are A3, it would be fair to assume an A4 shredder is best. For the comparatively little A3 being shredded, it’s just a matter of folding those pages in half before shredding them as long as you don’t find this an inconvenience. Now days, there is an extensive choice of Manually Fed and Automatic Feeding paper shredding machines. For Auto Feeding document shredders, one obvious consideration is the capacity of the auto feeder. As you research you will notice the larger the auto feeder, the bin capacity will also increase in size. Most Auto Feed shredders use rubber paper feed tyres to feed sheets of paper into the shredder. The rubber paper feed tyres do wear out over time however there is a select offering of Auto Feed paper shredders using Direct Feed technology and have no rubber paper feed tyres to wear out. Direct Auto Feed paper shredders are the future in office shredding technology. IMPORTANT! Auto feed paper shredders can be painfully slow in comparison to hand fed paper shredders. As a general guide, a similar priced hand fed paper shredder can be up to 30 times faster and often have a larger bin size. Productivity while shredding paper is influenced by capability to shred up to a certain thickness of paper, paper feeding speed and waste capacity/frequency of emptying required. Generally, the less time spent shredding the better however there is a balance between acceptable time spent shredding and budget. Now days most offices have various media carriers that are best destroyed, preferably using the paper shredder, these include CD/DVD/Blu-ray Discs & Credit Cards. In addition, office shredders made to shred document fasteners like Pins, Staples & Paper Clips are the preferred solution. When emptying your shredder, full bags of cross cut paper can be heavy to lift.